Join poet and essayist Anne Boyer and writer and critic Jennifer Hodgson for an evening discussing the extraordinary Ann Quin – female, working class and avant-garde, whose dazzling novels and short stories were as revelatory when first published in the 1960s as they are today. 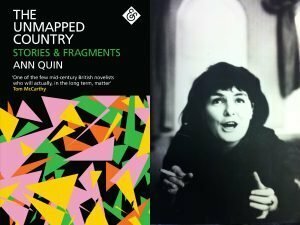 Quin’s writing has been reassessed beyond the status of ‘cult author’ with this year’s highly successful publication of The Unmapped Country: Stories and Fragments, edited and introduced by Jennifer Hodgson (And Other Stories, 2018). The event is hosted by Locomotrix and Housmans Radical Book Sellers and will be chaired by Anna Glendenning, editor at And Other Stories. For more information, visit the Facebook events page.